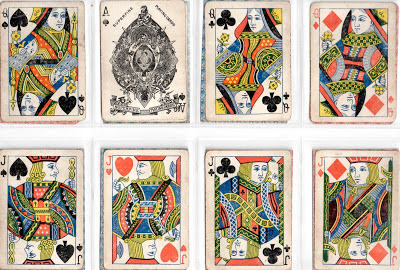 The playing card manufacturers of Germany from 1900 until 1939 provide a complicated set of relationships that deserve closer investigation. A lot of the firms ended up as component parts of Vereinigte Altenburger und Stralsunder Spielkartenfabriken (later becoming two separate firms, one in the East and one in the West, the latter inheriting the trademarks and continuing many of the patterns). 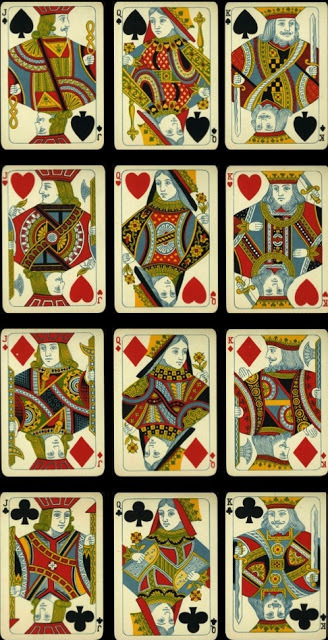 Since I don't have access to the necessary records relating to this period, I will limit myself here to illustrating some of the many types of standard English cards produced, some from firms that did not last very long. A number of different models were used, e.g. Dougherty and Goodall, but there are also some interesting in-house designs. 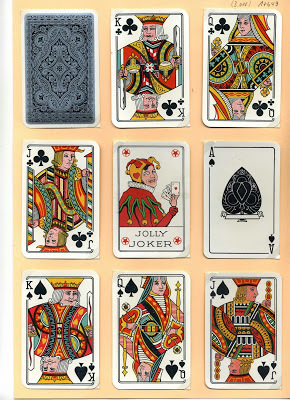 The first of these is by Dondorf, which was used in slightly different formats from c.1890-1925. Along with idiosyncratic clothing, we find an unturned QS with her attributes on opposite sides, an unturned QD with her pip on the left, so her posture is altered, a two-handed KD, a turned QC with arm and ermine from the traditional QS, and an orbless KC. Interestingly, Müller of Schaffhausen used the same style of head and posture, but with completely redrawn clothing. 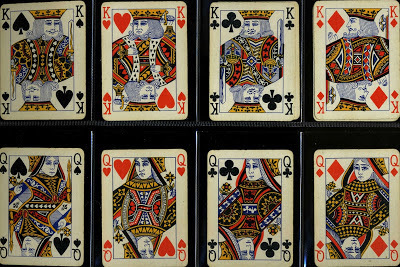 An example of a close copy of Goodall's courts can be found in an anonymous pack with a Goodall-style AS, blacked out where the name usually appears. 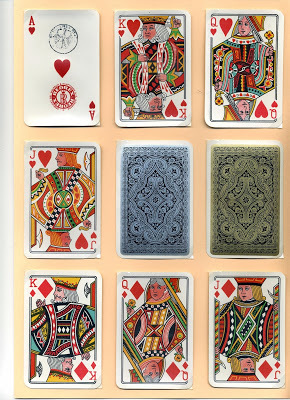 The pack may be by Wüst, who seem to have had some kind of tie-up with Goodall and "borrowed" their AS design in other packs, such as the one below with a copy of Dougherty's courts with six turned. 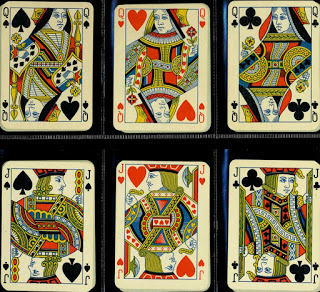 There is also an otherwise anonymous, wide-size Goodall copy with Oriental Playing Cards on the AS and box, and Made in Germany on the box. I think it's by F.X. Schmid. 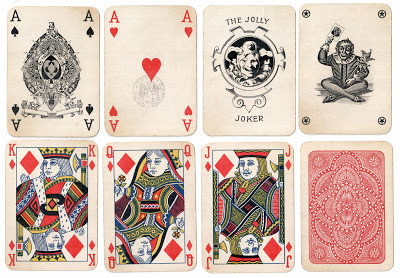 The rest of the illustrations are of idiosyncratic designs by various makers. Above: F.X.Schmid, c.1935; note the Goodall AS with the maker's name on it, and a copy of Goodall's joker; also the KD is not in profile [from Peter Endebrock]. 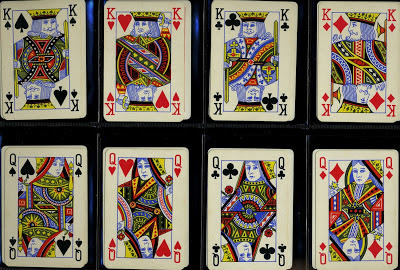 In the mid-1930s Dondorf used a different style of English court based on USPCC's wide-size turned set (US4). 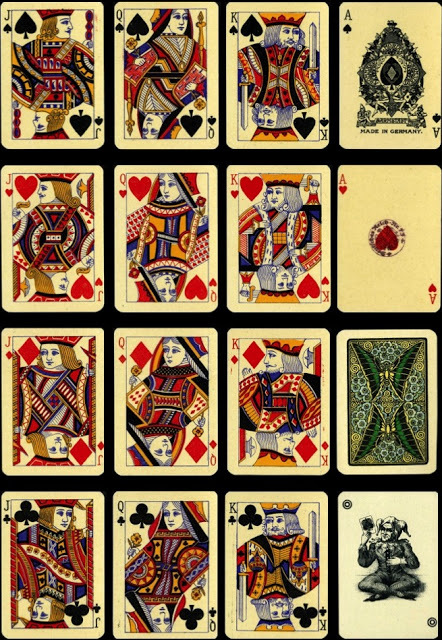 And about the same time Walther Scharff (Deutsche Spielkarten) used a bridge-size design based on USPCC's narrow Congress courts of the time (US3.1), which eventually was used by the East German card manufacturer in various forms up until reunification. Scharff also used a Goodall-derived AS like that of Frommann & Morian.